Judging by its reception, Black Panther did something right. Cinematically there’s not much to get excited about, but maybe there’s a lot to think about. 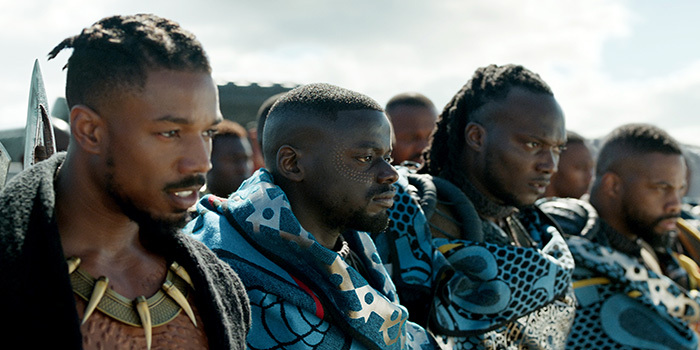 Black Panther is ridden with cliches and its dialogue is entirely expositional. But underneath this painful reduction to 10-year-old understandability is a conception that has proved resonant, the one dimensional characters acting as meaningful placemarkers for dichotomies of Malcolm X vs Dr King, or Mandela vs Mugabe, or is it Africa vs African America? What does it offer the people it purports to be for that the ouvre of overtly communitarian artists like Spike Lee, or for that matter well-intentioned outsider offerings like Blazing Saddles did not?†Black Panther’s plaudits for being a cultural watershed sound a bit like the praise Dances With Wolves got from people who’d never heard of Little Big Man. It does breathe life and seductive beauty into African heritage but elsewhere could have done with a bit less basketball and a bit more Basquiat*. Third generation grammy rap makes it all feel too much like business as usual. Come to think of it where the hell was jazz? Presumed dead? Standard white person disclaimer: I know nothing. †Black Panther was written an directed by African Americans but credits also go to Marvel’s Stan Lee and Jack Kirby. *While we’re defining ourselves by our ancestors, Basquiat was of Haitian and Puerto Rican descent but certainly privy to the black American experience).